Do you believe in books finding you? 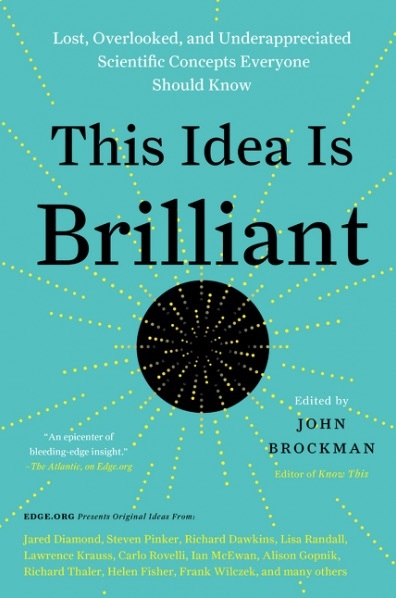 This Idea Is Brilliant, a book edited by edge.org founder John Brockman, found me last week. I don’t know if somebody had gifted it, or did I buy and forget about it? But I am just grateful for it. Published in 2018, it keeps its promise of assembling “lost, overlooked, and under-appreciated scientific concepts everyone should know”. Most of the concepts are narrated in small essays. But the one that stayed with me is a paragraph—yes, it is only one-paragraph long —by recording producer Brian Eno on ‘Confirmation Bias’. His observation resonated in the week of cricketer Hardik Pandya’s online inquisition or persecution, depending on what your own bias or belief is! Three people are standing in front of a painting in the museum, each one taking a picture of it. The art student copies it with brush and paint; The professional photographer bans it on the film in its analog camera; The tourist presses on the button of her smartphone. Which of these images is different from the other two? The art student has to spend more work on her copy; But in a sense the tourist is with the smartphone of cross-country skiers. Color on canvas, just like the bit of exposed film, is a purely physical representation; A chemical flower on a susceptible medium. The image can not exist independently of this physical embodiment. In contrast, the image stored in the smartphone is essentially numeric. In an approximate way, the camera divides its field of view into a grid of tiny cells in the smartphone and stores a set of numerical values ​​which represent the intensity of the colors in each of these cells; These numbers are the ones that are transmitted - in compressed form - when the picture is sent to friends or placed on the Internet. What scientific concept should be better known? Each year, the prestigious journal online Edge.org ( @edge ) requests to dozens of contributors, mostly famous artists, thinkers and scientists, to answer any question. . . . This January, the question was: "What scientific term or concept should be better known? " On the menu, 206 answers covering both physics and biology or the social sciences. There is no question of mentioning all of them, but many contributions revolve around psychology and the cognitive sciences, exploring in particular the notion of bias. Each year, the director of the website edge.org, John Brockman, asks a question to a group of intellectual collaborators, many of them belonging to the world of science but also personalities from the world of art, technology and of the music. The question he asked on January 1, 2017 was: Which term or scientific concept should be better known? According to psychologist and linguist Steven Pinker the second law of thermodynamics should be better known. One of the most quietly unsettling findings in psychology, for my money, is “verbal overshadowing” – a weird fact about memory that’s liable to make you wonder if anything you believe about your life is really true. The finding is this: putting your experiences into words – talking about them with others or writing them down – makes you less likely to recall them accurately. On closer inspection, this psychological oddity starts to look less strange. Language, as the linguist Nick Enfield points out, pretty much exists in order to categorise things – to sift the chaos of reality into the pigeonholes provided by our pre-agreed words. (He chose verbal overshadowing as his answer to the Edge website’s annual question this year: “What scientific term or concept ought to be more widely known?”) And putting something in a pigeonhole means not putting it into others, by definition. To describe someone as having three dogs is to focus on what the animals share – they’re dogs – and to disregard the fact that they’re a great dane, a sheepdog, and a yorkshire terrier; or old or young, excitable or placid. The research on verbal overshadowing, Enfield writes, suggests this pigeonholing overwrites the previous memory: “When words render experience, specific information is not just left out, it is deleted.” Even the best writer must unavoidably misrepresent the world – we couldn’t communicate otherwise . . . Try to build a tower by stacking irregularly shaped blocks. That is possible; Sometimes you reach a height of eight, nine, ten stones. Such man-made "Zen-Steintürme" or "Steinmannli" can be found along river banks and mountain peaks. They hold for a while, then the wind blows them over, or a bird lands on it and breaks the stone towers into the knee. What is the relationship between skill and height? Take some round stones from a river bank. A two-year-old child will be able to build two stones; A three-year with advanced hand-eye coordination creates three. It takes experience to get up to eight rocks. And only with tremendous dexterity and a lot of Trial-and-Error attempts is it to be more than ten. Dexterity, patience, and experience are at times boundaries. "You can never understand a language—unless you understand at least two languages." Edge.org also launched the 2017 annual issue—what are the most noteworthy scientific terms or concepts? Dr. Peter Lee, Senior Vice President of Microsoft Worldwide, was invited to give a briefing on the past and present of this scientific term transfer learning. What scientific concept is the most important thing people know too little about? This week's most important scientific news was enough that NASA and NOAA in the United States confirmed that 2016 was the warmest year. The European Copernicus program recounted the same already for more than a half week ago, but since it's not exactly the same data set that underlies the two statements, there was still some uncertainty about whether 2016 was actually warmer than in 2015. Writing recently at edge.org, one of the founding fathers of evolutionary psychology, John Tooby, answered a question which had long baffled me. Why do people on the left get more agitated about transgender bathroom access or hate speech than they do about modern slavery? Tooby explains: ‘Morally wrong-footing rivals is one point of ideology, and once everyone agrees on something (slavery is wrong) it ceases to be a significant moral issue because it no longer shows local rivals in a bad light. Many argue that there are more slaves in the world today than in the 19th century. Yet because one’s political rivals cannot be delegitimised by being on the wrong side of slavery, few care to be active abolitionists any more, compared to being, say, speech police.’ I might also add that many of the practitioners of modern slavery might be a bit foreign–looking, and so in criticising them you run the risk of violating some leftist tribal shibboleth. Science is the most reliable way to generate knowledge. This is the conviction of the Edge community which every year, for the past twenty years, has gathered around its long-time driving force John Brockman to answer a big question through which we can supposedly arrive at the edge of knowledge. In this period, however, knowledge empirically derived by the scientific method reveals an amount of information of varying quality and varied provenance which would seem to question the credibility of any belief and any consensus on the practical experience of reality. 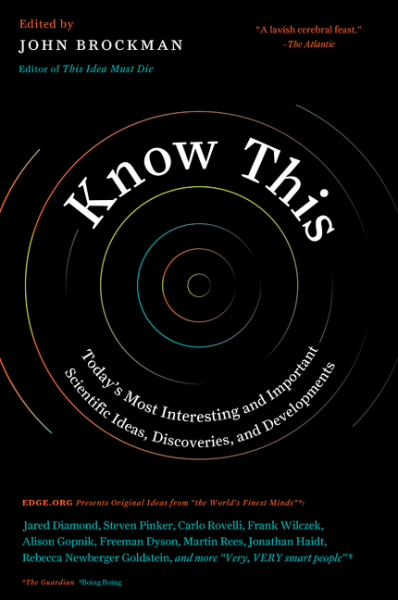 So one might ask: do we know enough about scientific knowledge? And, above all, can the scientific method be recognized as the most reliable? This is probably why Brockman asked his community of scientists, researchers, intellectuals, and creative interpreters to answer a seemingly simple question: "What scientific term or concept ought to be more widely known?" Many contributors decided to respond by citing the latest discoveries that are actually not well known. Joi Ito, Director of the MIT Media Lab, described Neurodiversity, a concept that challenges the definition of "autism" and embraces the diversity of ways of being human. Kevin Kelly, a pioneer in the narrative of technology, highlighted the concept of Premature Optimization to show that a success obtained in the first phase of a project’s development can put a brake on a bigger success: which is a recommendation for not only accepting the mistake but also for maintaining a critical attitude regarding what has already been discovered. And the Futurist Paul Saffo wrote about Haldane's Rule of the Right Size, which shows every organism has an optimum size and a change in size inevitably leads to a change in form, which is applicable not only to organisms, but also to technologies and organizations. But the Edge community, with its distinguishing humility, thought that it was necessary to also take into account those who don’t know the most basic scientific concepts. An example? A couple of years ago a survey from the National Science Foundation reported that 25% of Americans are convinced that the Sun revolves around the Earth, more Americans than those who voted for the new President of the United States. So, with great sense of reality, astrophysicist and author Mario Livio decided to dedicate his contribution to The Copernican Principle, which states that the Earth is not at the center of the solar system. And Steven Pinker, who does research in a vast territory between cognitive science and language, in turn, has devoted his contribution to The Second Law of Thermodynamics, which states that in an isolated system (one that is not taking in energy), entropy never decreases. It is a basic concept that shows how closed systems not interconnected with the outside tend inexorably to become less structured, less organized, less able to do interesting things, until they fall into a monotonous and uniform situation where they stop. And die. For Pinker, this is instructive for society. Giving up the liaison with the other societies, not accepting energy and information from outside, leads to social death. In writing about Confirmation Bias, the artist Brian Eno has found a balance between the need to provide information about a new scientific concept and to divulge an element of basic knowledge by dedicating his contribution to the error of perception due to the search for confirmation: “The great promise of the Internet was that more information would automatically yield better decisions. The great disappointment is that more information actually yields more possibilities to confirm what you already believed anyway.” In fact, scientifically, what was wrong was the word "automatically." The internet is not the wisdom machine, but only the information machine. But it was conceived in such a way that it is constantly renewed through innovation. This is what Edge pushed us to do. What scientific idea should be better known? One cited anecdote—which some say is apocryphal and whose central character varies according to the story—tells us that when, in the last decades of the nineteenth century, Darwin's theory that humans descended from monkeys spread in England, the wife of the bishop of Birmingham responded, shocked: "Dear, let's hope it is not true. And if it is, let's hope it does not spread." Those words take up the Edge website to present its annual question ( Edge Question ) this year. 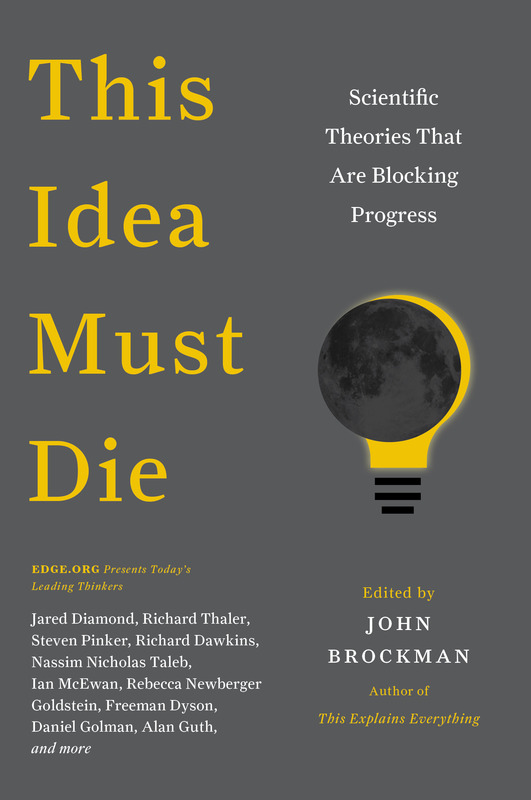 Every year, writer and publisher John Brockman hosts discussions on innovative ideas from the most diverse fields of science and proposes a provocative question to a number of intellectuals, scientists, artists and writers. Answers vary from small essays to a paragraph, but all have the spirit of those who are thinking about the boundaries of their disciplines or crossing them. "What should we care about?" 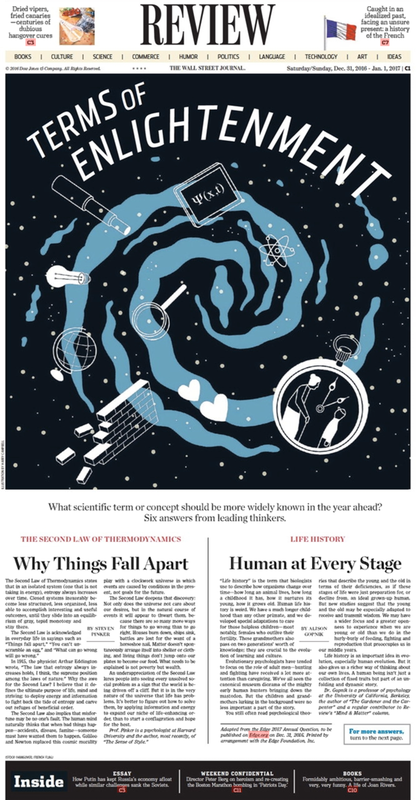 "What scientific news was the most important this year?" 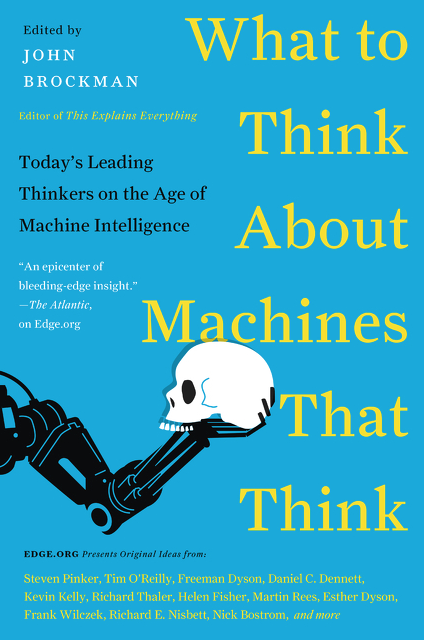 "What do you think about the machines you think?" "What will change everything?" These are some of the questions from previous years, whose answers are then published in the form of books. 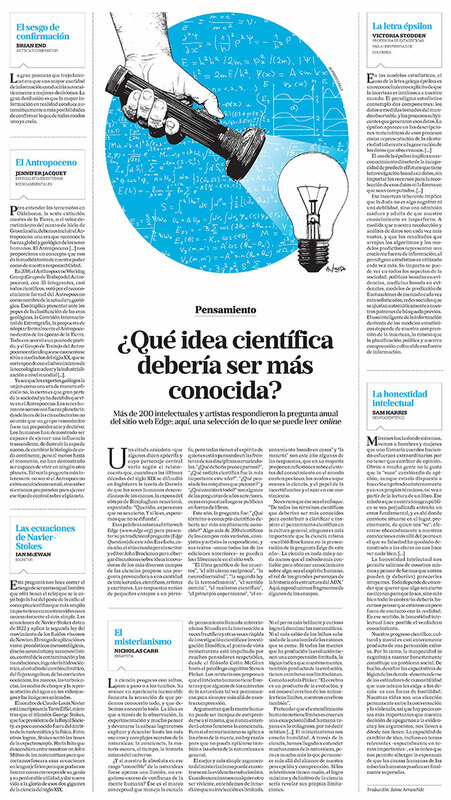 This year, the question was: "What term or scientific concept should be most widely known?" More than 200 scientists from the most varied fields, essayists and artists responded, and their texts—like all previous editions—can be freely read on the website. "The Genetic Book of the Dead," "Reciprocal Altruism," "Neurodiversity," "The Second Law of Thermodynamics," "Common Sense," "Scientific Realism," and "The Copernican Principle," are some of the answers this year, which mostly propose reflections on the status of knowledge in the contemporary world, the ways in which science advances, and the role of uncertainty and chance in that movement. It is not uncommon for that to be the approach. "Of all the scientific terms that should be better known to help clarify and inspire scientific thinking in general culture, none is more important than 'science' itself," Brockman wrote in presenting this year's Edge question. "Science is nothing more nor less than the most reliable way of gaining knowledge about anything, whether it be the human spirit, the role of great figures in history, or the structure of DNA." Here, we reproduce excerpts from some of the essays. Major thinkers, researchers, and scientists present twelve concepts that everyone should know and which produce fertile new hypotheses. The phrase is as apodictic as it is arrogant: "Science does not think." When Martin Heidegger pronounced it in 1951, he had his finger on the pulse of his time. These few words do not only express a fresh self-assurance of philosophy, but also a newly awakened awareness of problems. The scientific and technological approach, according to Heidegger's findings, transforms the world into an object of human manipulation which ultimately will threaten the very existence of man through the atomic bomb and human genomics. The tone is unmistakably apocalyptic. While science does not know where it is going, philosophy sees it quite clearly: into ruin. Heidegger's statement resonates to this day. Even in 2017, it is still de rigeur for a certain kind of intellectual from the humanities department to look down on natural sciences, despite all inter- and transdisciplinary efforts. They don’t usually judge on the basis of their own knowledge or of a presumably higher insight like Heidegger—who was, after all, well acquainted with the most recent findings which physics and biochemistry had brought forth in his time. 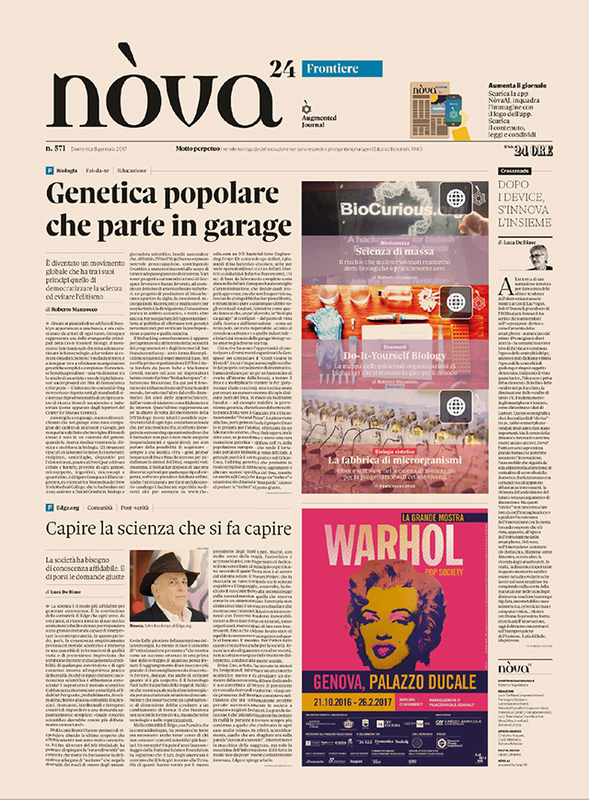 Rather, they do it ignorantly and from a safe distance, cultivating with considerable fuss what hermeneutics calls a "prejudice": Since our mental life is so rich, what should evolutionary theory or microbiology have to teach us about the human being, this insolvable riddle? Thus we have been taught in our studies: the humanities want to understand the life of the human spirit, while the natural sciences are trying to explain the phenomena of nature. The two areas are completely different in methodology, and their representatives have nothing to say to each other; there can be nothing but misunderstandings. But even sophisticated hommes de lettres experience today how, in the wake of science and technology, our life is changing fundamentally—and with enormous speed. This also affects their self-understanding. Do philosophers, literati, and intellectuals continue to regard themselves as interpreters of a world which appears to them only as a black box, and therefore, as it were, specialize in the consolation of their peers? Or do they dare to reconsider the great old questions, not evading the friction with new scientific knowledge: What exactly is life? When did it begin? How does man tick? How deep is the universe? Is the universe a computer? Is there intelligence outside the earth? What is consciousness? The British physicist and writer Charles Percy Snow had outlined the profile of this new kind of intellectual already half a century ago. He spoke of men of the "third culture", equally well-versed in literature as in science. But Snow's concept remained a dead letter until John Brockman adopted it 25 years ago. Who is this man? Brockman, who was part of the New York avant-garde scene of the 1970s with people like John Cage, Robert Rauschenberg and Andy Warhol, found his way from the outskirts of experimental art into science, which he regards as a kind of creative practice. 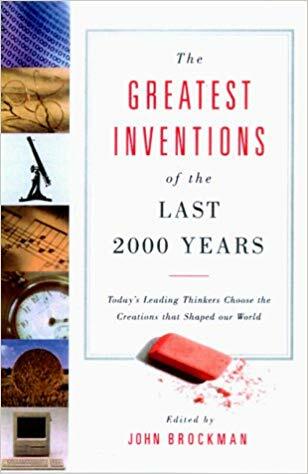 The focus of his interest is on cybernetics and evolutionary biology, and his growing certainty that we are "living in one of the most exciting periods of cognitive activity in the history of mankind" compares most closely with the spirit of the Renaissance. Edge is a cybersalon for extensive scientific debate with a claim to be at the edge of knowledge. Brockman first saw himself as a homo universalis and man of the third culture, before he set himself up as an "intellectual universal impresario" (David Brooks), putting himself in the service of this culture in order to earn money. In the 1980s, he began to build up a vibrant network of authors working at the interface between natural sciences and humanities. He represents many of them as a literary agent, some of them to this day. This New York Humanist milieu evokes memories of the productive, adventurous Parisian intellectual scene of the 1960s. Today's thinkers, however, do not see their task in hagiographical interpretation of the texts of founder figures (Marx, Nietzsche, and Freud) in order to prove themselves the only true disciples. Rather, the new authors take up inspiring ideas from Darwin, Neumann, or Maturana, in order to more precisely conceive our living present. Instead of an exegetic look at the rear-view mirror, then, we find a robustly optimistic will to shape the future. No doubt there is a lot of hubris in the game, but just as much daring and the healthy self-confidence of science-savvy intellectuals who insist on living up to their curiosity. This is how Edge came into being: a cybersalon designed for wide-ranging and accessible scientific debate with the claim to be at the edge of knowledge. For twenty years, John Brockman has put a question before his community at the end of every year and the responses are published at the stroke of midnight on New Year's Eve on www.edge.org. The 2017 Question is: "What scientific term or concept ought to be more widely known?" You can read a selection of the responses in this Feuilleton. Some of the authors provide science fiction in the best sense of the word—fragments from the workshop of speculative-narrative reason. We intend to cultivate this discipline more consequently in the NZZ Feuilleton. A look into the intellectual laboratory of the future must be an integral part of a discourse oriented towards the true, the good and the beautiful. 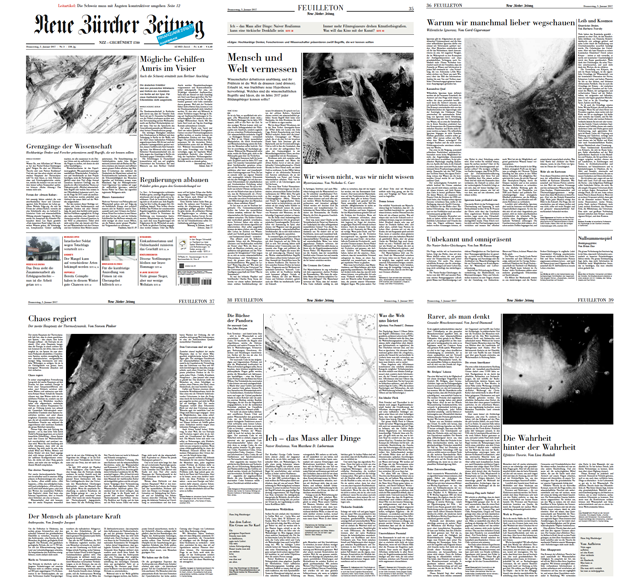 Translation of René Scheu's essay from German and articles from English: Angela Schader. Design concept and images (macro shots of the ice on the Lago Bianco): Reto Althaus. We generally consider knowledge to be a desirable commodity. But there are situations where people voluntarily forgo information - and those in which ignorance is even practical. Imagine taking over 200 international thinkers, including writers, artists and many, many scientists of all disciplines. Place them in front of a challenging question and collect their responses on a web site. It seems difficult to find a better way to greet with understanding the arrival of 2017. To do so we thought the literary agent John Brockman with his Edge Foundation. The ritual is repeated every year and this time the question was the following: “What scientific term or concept ought to be more widely known?” That is, being able to choose freely a bud in the casket of knowledge, which you would show humanity at the beginning of this year. What piece of knowledge do you want to put metaphorically in your pocket, to walk toward the future with a greater awareness of the world? And do it with without pedantry and jargon. According to the novelist Ian McEwan, one of the 206 intellectuals invited to participate, the beauty of this game is that among the rules of engagement there is the invitation to be open-minded, free ranging, intellectually playful, to indulge in the unadorned pleasure in curiosity. Scientific ideas often remain confined among insiders, but sometimes science goes mainstream, and the most versatile and fortunate intuitions breach into the general culture, enriching it, and changing it in turn. This happened to the memes of Richard Dawkins, to the paradigm jumps of Thomas Kuhn, to Schrödinger’s Cat, just to name some examples. Among the many ideas suggested this year, and candidates to become viral, a recurring theme is that of the peculiarities of scientific thought that would deserve to be exported to other fields of human knowledge and action is that science is a master of failure, critical spirit, intellectual honesty. Sometimes it delivers uncomfortable truths, as it reminds us of the famous phrase attributed to the wife of the Bishop of Birmingham on Darwin’s theory of evolution. Commenting on the embarrassing kinship between men and monkeys she apparently said: "Hopefully it is not true and, if it is true, that you do not know around". The 206 responses to the 2017 question will eventually be published in a book. Here we have seven contributions, selected because they are particularly surprising and sometimes even useful in everyday life. Their merit? They warn of prejudices, educate complexity, cultivate wonder. What scientific term or concept should be more widely known in the year ahead? 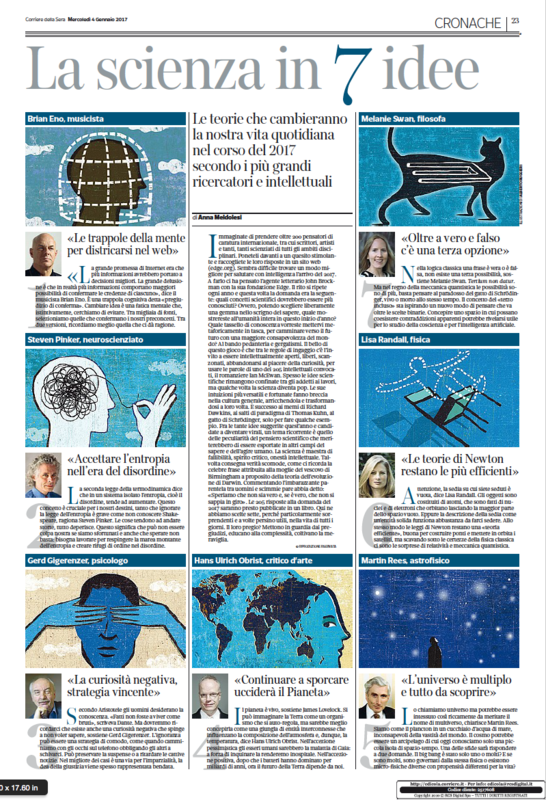 Six answers from leading thinkers.